In its pursuit of the “perfection” of the Aryan race, Nazi Germany did not hesitate to persecute and punish homosexuality in the Third Reich. The Nazis believed that homosexuals were weak and effeminate men who were not fit to fight for the nation. Moreover, they made no contribution to the German birth rate. Generally speaking, lesbians were not classed as a threat to the racial policies of the Third Reich and suffered less from persecution than men. 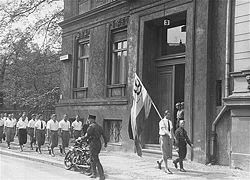 On 6 May 1933, students directed by the SA (Sturmabteilung) entered the Institute of Sexual Sciences in Berlin. 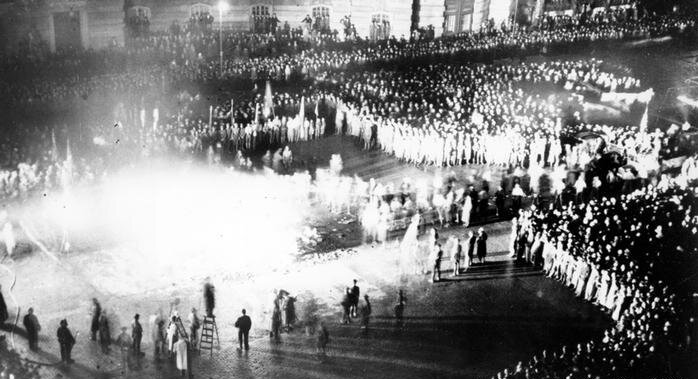 Four days later, its irreplaceable collection of over 12,000 books and 35,000 images, together with thousands of others classed as “degenerate” by the Hitler regime, were burnt in a large bonfire in the centre of Berlin. It was the first in a long series of measures to eradicate gay and lesbian culture. The episode was followed by the closure of mythical bars like Eldorado, the prohibition of publications like Die Freundschaft (Friendship), the creation of “pink lists” and the establishment of a broad legal framework for the persecution of homosexuality, which meant that even intentions and thoughts could be classed as “indecent criminal activities between men”, punishable by indefinite imprisonment without trial. However, just when it seemed things couldn’t get any worse, on 4 April 1938, the Gestapo publicly announced that men condemned for homosexuality could be deported to concentration camps. Between 1933 and 1945, acting under the orders of Heinrich Himmler, leader of the SS, the police arrested around 100,000 men suspected of the crimeof homosexuality. Half were sentenced and sent to normal prisons. Between 5,000 and 50,000 of these were interned in concentration camps and marked with a pink triangle. In his memoirs, Rudolf Hoess, commandant at Auschwitz, describes howthe camp guards would often assign homosexuals to some of the most dangerous jobs and they were sometimes separated from other prisoners to prevent homosexuality being “propagated” to other inmates and guards. Judges and officials at SS camps could even order the castration of homosexual prisoners without consent. 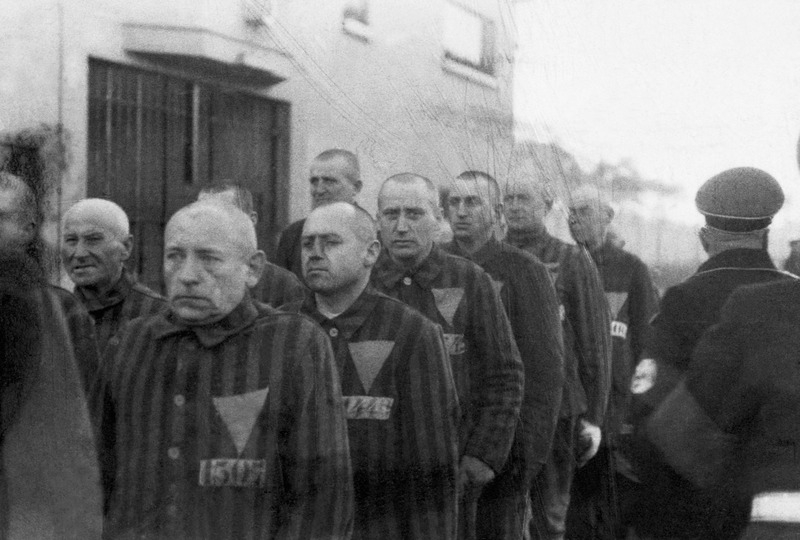 The SS doctors also performed cruel experiments on prisoners to “cure” them of their homosexuality. In fact, these tests resulted in illnesses, mutilations and even the deaths of inmates but produced no scientific knowledge. Even though there are no definite statistics on the number of homosexuals murdered at the Nazi camps, they were especially vilified and singled out for punishment. Of the 400,000 people officially recorded at Auschwitz, only 75 received pink triangles. However, thousands of homosexual men and women were murdered during the Third Reich. “Loving Boys” (1928), painting of the artist Christian Schad. Original in the collection of the Christian Schad Museum, showed in Auschwitz. Not long ago. Not far away. Source: United States Holocaust Memorial Museum(USHMM). About the museum: The United States Holocaust Memorial Museum (USHMM) is the United States’ official memorial to the Holocaust.